Save your bottles this holiday season for Dry Grad Donations!! Volunteers are required pick up bottles from routes on Saturday, January 5th/19. The NWSS Food Drive – YOU DID IT N’DUB!! Once again, the New West Hyacks came through with enough donations to meet our goal!! 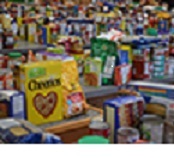 55 families will be helped with our hampers – that is about 140 individuals!